Good morning friends! It's time for our August Giveaway! This is month is all about summer and enjoying this last month before the cold weather sets in. Michael Miller's fun fabric, "Trailer Travel", is my inspiration. I've included a white with aqua dot for background and six other pieces of fabric to round out a pretty summer quilt. The book this month is "Fun Quilts" by Me and My Sister Designs. The book has plenty of colorful inspiration to get you sewing! The giveaway will end Thursday, August 9, at midnight. The winner will be announced by Random Generator on Friday, August 10. Great giveaway! we haven't had much of a summer here in the UK! I am a follower and am now starting to enjoy quilting! 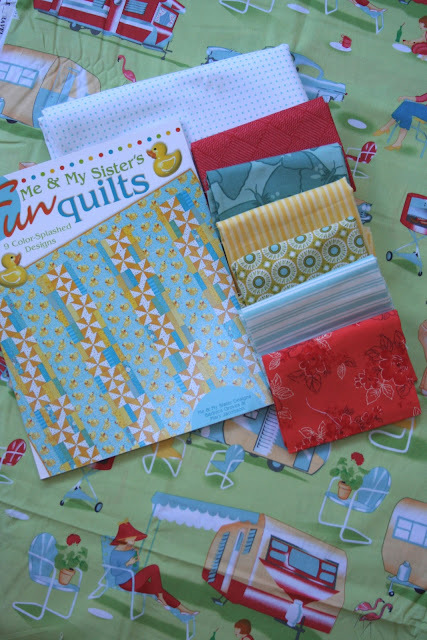 I would love to win the August giveaway, the fabrics are fun and happy and would be a joy to quilt this winter! Thank you for the chance to win! I'm a follower and always enjoy your blog, esp your Sunday scripture posts. I'd love to be included in your giveaway. I'm already a follower who especially enjoys your "Sunday Scriptures." Thanks for the opportunity to win your giveaway. I think Im following you but not sure that I am. Would love to have the chance to enter your giveaway. I love the Travel Trailer material! I became a follower . Those fabrics are fun especial the one with the caravans: vacation.!! I love the title of the quilt book, it looks like a fun and creative quilt book. How darn cute is the "trailer travel" fabric, I absolutely adore it! sewing a quilt with the trailer travel fabric would be sew fun! I am already a follower of Sewn with Grace.. I am a follower. Nice colors in the fabrics. What fun fabric to go with a "Fun" book. Sweet! I am a follower - what a great prize pack. I love the fabrics you chose! Thanks for the chance to win! I'm a follower! Thanks for the generous giveaway! Oh my goodness, that trailer fabric would be so perfect to make something for my in-laws who did lots of trailer travel when my husband was growing up. Thanks for the chance to win! I follow your blog. I'm a follower! What a great prize! What a FUN give away! I love the fabric...perfect for summer....and I love following your blog. I'm a follower. Love to win these pretties. I am most definitely a 'follower' and am absolutely in love with that fabric! It so captures the wonderful summer vacation feel!!!!! HELLO! HAPPY TO FOLLOW YOU ON BLOG LOVIN'! THANK YOU FOR A CHANCE TO WIN! HAPPY STITCHING! love the trailer fabric, so cute. I'm a follower of your lovely blog. Thanks for the chance. I am a follower of your blog. What a wonderful prize and I hope I win. What a sweet giveaway! I'm a happy follower typing with crossed fingers! :-) Thanks for the chance! Adorable prints!!! I'm a fan/follower, sign me up! I'm a follower too! I just love this fabric! Fingers crossed! Thanks for having this giveaway! How gorgeous is the caravan fabric! Thank you for this lovely giveaway. I'm a follower. Love the fabric and also a follower. Been reading for a long time. Use to camp when our kids were young. Lots of wonderful memories! Love the fabric. I'm new to all of this, but I'm trying to learn and will follow your blog! I'm already a follower. The fabric does bring back thoughts of "yore" when camping was fun as was "going to camp". Thanks for the giveaway. Lovely trailer fabric! very pretty! I follow your blog. Beautiful fabric. Such a great give away. I am a new follower! I love the fabric collection. What an awesome prize. I am a follower. I am a follower of your blog. Thanks for a great giveaway. What fun yummy fabrics! I'm a follower who loves your blog! Thanks for the opportunity to win. I am a follower. Thanks for the great giveaway. I have never seen this book and the fabric is sew cute. Looks like a whole lot of fun! Thanks for the chance!! I found you through Jenny Of ELEFANTZ... I am now a follower. I love the embroidered piece in your post below. I'll be visiting often! Your creations always inspire me!! What a great giveaway! I would love to win this for my mother. This fabric is absolutely fabulous! I love anything related to vintage camping and someday I would love to have a vintage camper! I have followed you for quite a while and always enjoy your posts. I love your Sunday scripture. It always touches my heart and inspires my walk with our Lord. Its so much fun to see all you create. Thanks so much. I am a follower. Lovely giveaway! I'm a follower. Hope I'm the lucky winner! I love that travel trailer favric. Makes me think of the Lucille Ball movie the Long, Long trailer. Michael Miller's prints are such a slice of Americana! Just love those long long trailers....Reminds me of Lucy and Desi. Lucky me to spot your blog! Great give-away! Always exiting just to be able to participate. Have fun! Nice giveaway- thanks for the chance to win. I'd like to subscribe by email, but I don't see a button. Can you help? Hello my name is Célia, I'm from Brazil and I loved your blog posts and mainly on the word of God. Congratulations! I'm already a happy follower...thanks for the chance to win!! 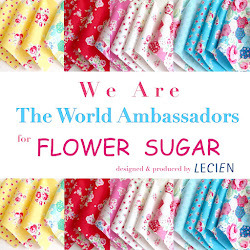 I am a follower..love this fabric..Thanks for the giveaways! I'm a follower. I love your blog. Thanks for the chance to win. I am a happy regular follower of your blog -- love your fabric choices for summer! Good morning. I have been a follower for a while now. I always enjoy my visit. Great giveaway. Thank you for including me. I am a follower and I LOVE, LOVE, LOVE this travel trailer fabric. We have a camper (going this weekend as a matter of fact) and I absolutely love this! It would make a cute lap quilt for the camper or a tote to haul my stuff that I can't leave at home in!! I am a follower! Thanks for the great giveaway, fun and you can never go wrong with MM fabric. Reminds me of the movie with Lucy and Desi going camping!